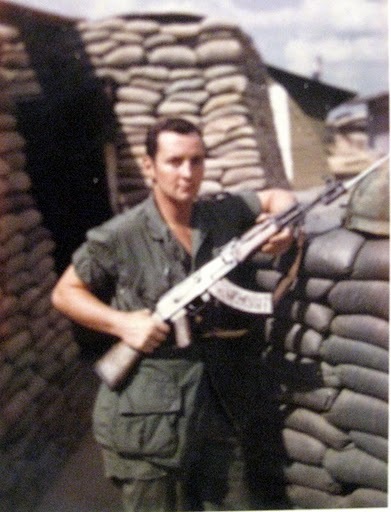 Pat Farino of Port Charlotte, Fla. went to Vietnam in 1968 with the 101st Airborne Division. He was a 22-year-old airborne trooper who served with the ‘Screaming Eagles’. Much of the time Farino was a scout who drove a Jeep with a machine gun mounted on it. He drove around under the triple canopy jungle looking for North Vietnam Army (NVA) regulars and Vietcong (VC) irregulars. It was a dangerous job. “The NVA and the VC were good soldiers. They were masters of camouflage. They could disappear in the blink of an eye. You wouldn’t know where they were. That’s what made it so frustrating. They were always ambushing us and then melting away into the jungle,” he explained. “I’ll never forget Landing Zone Forward. It was a little peninsula that jutted out into the South China Sea. We had our headquarters on the peninsula. We had three APCs (Amphibious Personnel Carriers), two Marine tanks and a mortar team in the middle. Three strands of barbed wire encircled us,” he said. “One evening I went out on a six-man ambush team. We were in the middle of a rice paddy when we spotted an NVA or VC mortar tube to the front and right of our location,” Farino said. “Some time around 3 a.m. all hell broke loose. We were told to stay put and wait for the sun to come up. 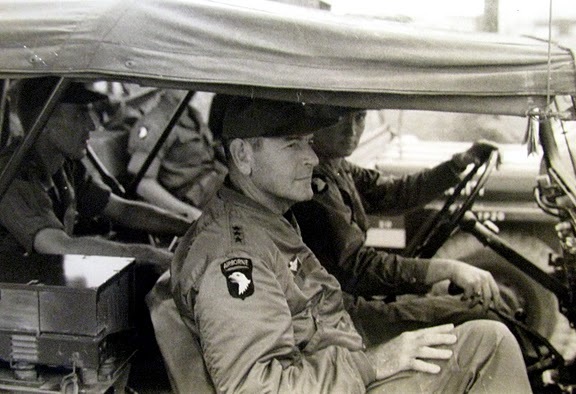 “We were suppose to sweep left and see what the VC and NVA were up to. There was a number of dead VC in our path. A few NVA with satchel charges had gotten under our barbed wire, into our trenches and attempted to blow themselves up. They only wore shorts and their bodies were covered with some kind of black stuff,” he said. “During the ensuing fire fight we asked the tankers to turn their tubes around and lower them so they could fire point blank into the enemy,” Farino said. “I think we killed 20 or so of their snipers and wounded two or three others that we captured,” he added. “We had to find a hole to bury all these guys in. I found a bomb crater to put them in. We dragged ’em over to the crater and filled up the hole with dead NVA,” Farino said. “We covered ’em over with a little dirt and sand we found nearby. “A month later, after we left this location and returned to our fire base at Camp Eagle, myself and three other guys were sent back to where we buried the dead NVA to rebury them. The locals were digging them out of their mass grave for their equipment,” he said. “We were helicoptered in. You could see the VC running for the tree line as we landed. We jumped from the helicopter and started gathering up the junk the locals pulled out of the shallow grave site we made weeks earlier,” Farino said. “I didn’t know I was standing on the spot until I started slipping and sliding on the remains of dead bodies we put in the ground weeks earlier. I didn’t turn around and look back, but I’ll never forget it. It was just one of those things you’ll always remember,” he said. “We were always getting in some kind of trouble. This particular day I was the second Jeep in the convoy. We were going out in convoy to get A-Troop that was pinned down,,” Farino said. “We were headed down this two lane dirt road just wide enough for two Jeeps. “The lead Jeep went over a hill, out into a rice paddy, made a left turn and blew up. It hit a mine,” he said. “We called in Medevac and a mine sweeping team. They swept for mines from where the Jeep had blown up all the way back to us. 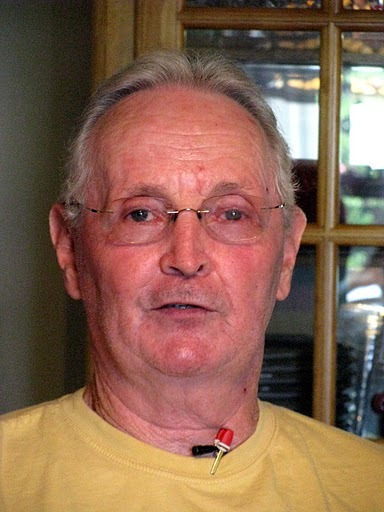 “For some reason my buddy Woodard, who was driving the Jeep behind me, pulled out of position, drove around me, went over the berm in front of me and down into the rice paddy, hit another mine and blew up, too. He and the guy with him were both killed,” Farino recalled with a pained expression four decades later. 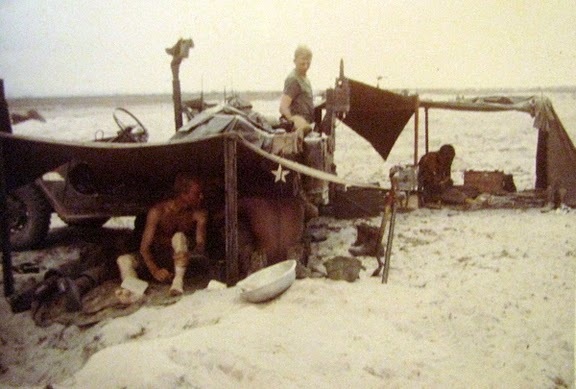 “Ir was a bad day in Vietnam. We were livid,” he said. In September 1970 Farino returned to the U.S. from Vietnam. He was a sergeant. Farino joined the Massachusetts National Guard. Two years later he re-upped in the Army as a member of the 142nd Signal Battalion, 2nd Armored Division at Fort Hood, Texas. “I started out running a base TV station at Fort Hood. We filmed mock battles in the desert and interviewed personalities like Gen. George Patton Jr.,” he said. “After that I was sent to Armed Forces Radio Network in Frankfurt, Germany. He left Bragg and spent a year in Korea at Training Support Activity over there. 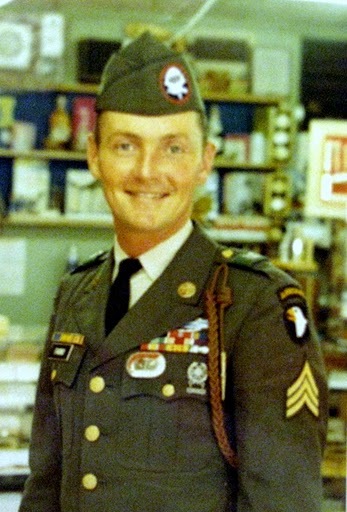 The career soldier came back to the Army’s Audio Visual Center at the Pentagon and worked in the Combat Pictorial Department as the senior member of the Airborne Rapid Deployment Team. Farino spent the next few years filming Army activities around the world. In 1989 he accompanied Army troops into Panama during the removal of the country’s strong man, Manuel Noriega. “We documented everything that happened during that invasion with our cameras,” he said. “I also went to ‘Operation Desert Storm.’ I had a large photographic team out in Saudi Arabia covering the war. We returned from that conflict in December 1992 just in time to be sent to Somalia shortly before the events dramatized in ‘Blackhawk Down'”, he said. Less than a year after returning from Somalia he retired from the Army a master sergeant with 24 years of service. In 1999 he married Jeanne Letourneau. He has two sons, Jether and Jon Michael from a previous marriage. Jether is an Air Force captain and psychiatrist at Lackland Air Force Base in San Antonio, Texas and Michael recently graduated from flight school a first lieutenant. Jeanne also has a son, Robert, from a previous marriage. Name: Patrick John Farino, Jr. This story was first printed in the Charlotte Sun newspaper, Port Charlotte, Fla. on Monday, July 25, 2011 and is republished with permission. Click here to view Farino’s Collection in the Library of Congress’ Veterans History Project.